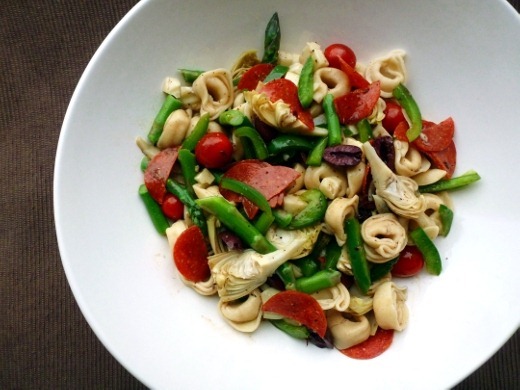 The motivation behind making this recipe was my desire to use up the half-bag of tortellini that has been in my freezer since I made Beef Tortellini Stew a few weeks ago. This recipe baaaarely involves any cooking. Does boiling water and tossing in pasta count as “cooking”? Debatable, but I lean toward no. 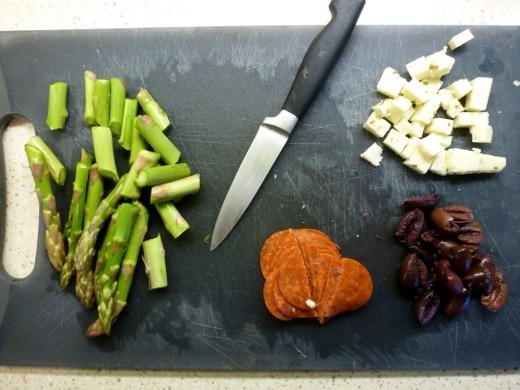 Initial prep work involved chopping asparagus into bit-size spears, slicing pepperoni and kalamata olives in half, and cubing pepper jack cheese. I love all these ingredients! 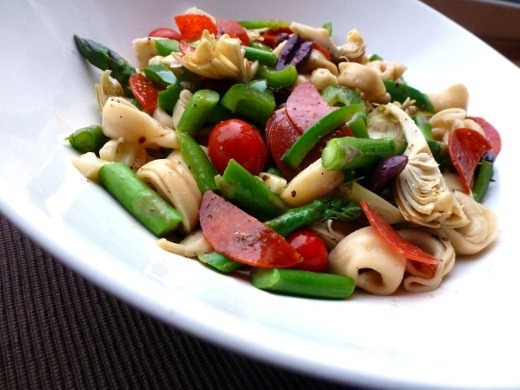 The recipe for this pasta salad is quite flexible and forgiving, with much room for substitutions and omissions based upon your preferences. For instance, the recipe calls for bottled roasted red bell peppers. 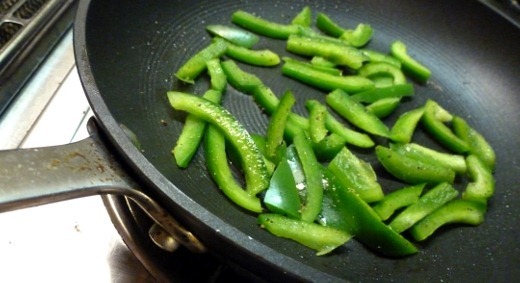 Instead, I had fresh green pepper on hand, and I simply sautéed it for a few minutes, just until it was crisp-tender. 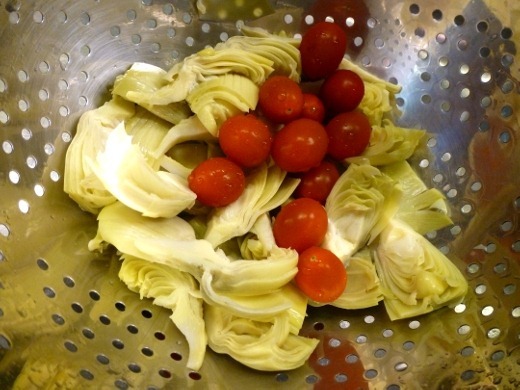 Other ingredients: canned quartered artichoke hearts and grape tomatoes. While I love recipes involving homemade dressings (especially this one! 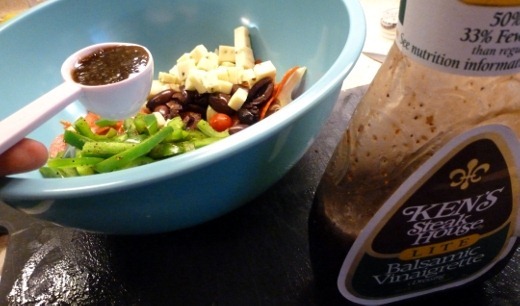 ), this dish was so quick and easy, that I appreciated using a few tablespoons of bottled lite balsamic vinaigrette. My oh my, what a pretty little salad! 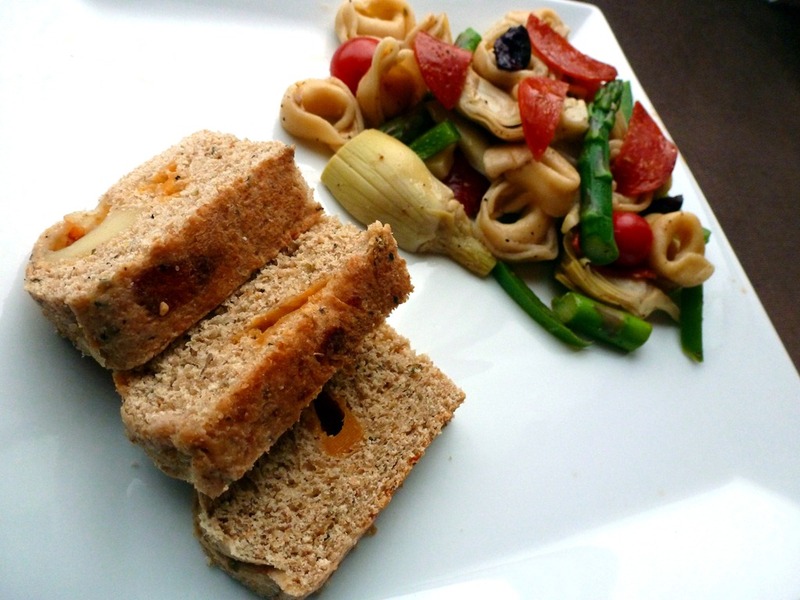 We made a meal out of this Mediterranean Pasta Salad, paired with more Four Cheese Great Harvest Bread. Every bite was different and so delicious. I threw this nutritious and tasty dinner together in about 15 minutes today – you have got to love that! Recipe from Cooking Light Fresh Food Fast Weeknight Meals, Oxmoor House, 2010. The recipe states it makes 3 servings, and the huz and I found this to be the perfect size for two hungry people for dinner, paired with bread.